This high-minded beach house is located on Prouts Neck. It earned its nickname “The Birdhouse” with its high gambrels and quirky shape. 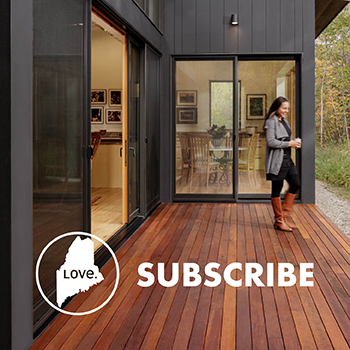 The home was designed by Union Studio Architecture and Community Design in Providence, and built by R.P. Morrison Builders of Windham. In contrast to the exterior, the inside of the Birdhouse is an exercise in contemporary colors and sophisticated restraint. 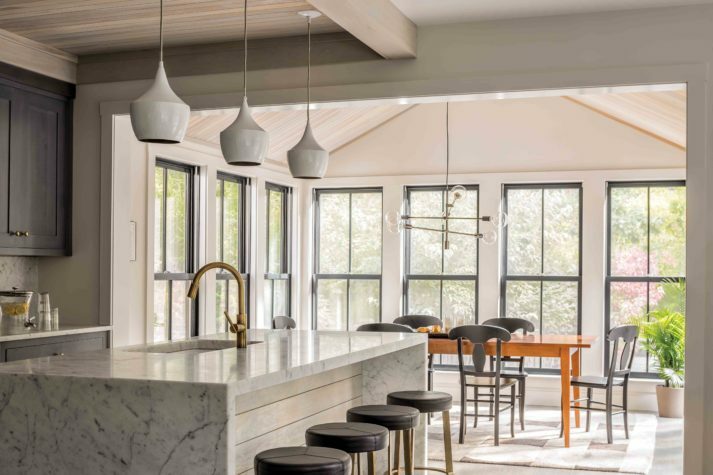 The kitchen features a waterfall marble island and marble backsplash, a pickled pine ceiling, stools from CB2, and lighting from Circa Lighting. 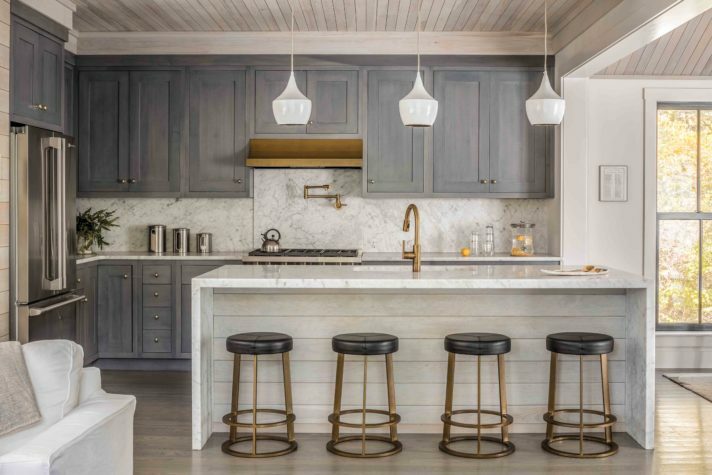 Brass, black, and gray are the dominating colors in this elegant kitchen. The cabinets are custom made from maple and feature a dark gray stain. The plumbing fixtures are from Newport Brass. 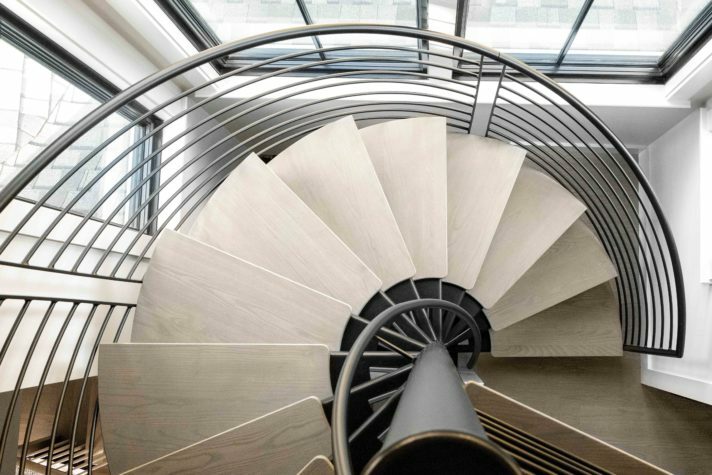 Shot from above, the staircase reveals its elegant form. 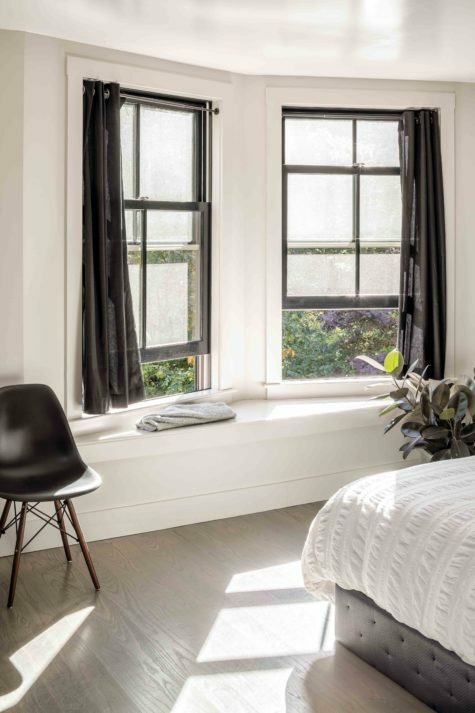 In order to gain more space in the home, the architect opted to build up rather than out. The original beach home was small and had little room for guests. Now, the homeowners have three stories’ worth of space, plus a furnished basement/ bunk room. 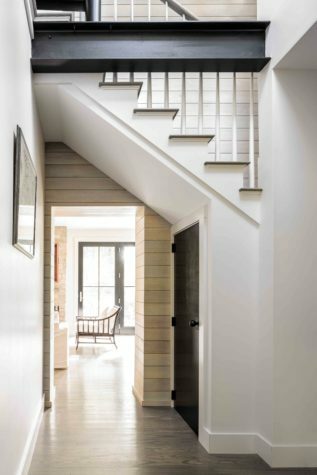 “The architect liked seeing something a bit more raw and industrial,” explains Jenny Morrison of the black steel structural beam that looms above the first-floor hallway, which features ash wood flooring treated with a country gray stain. 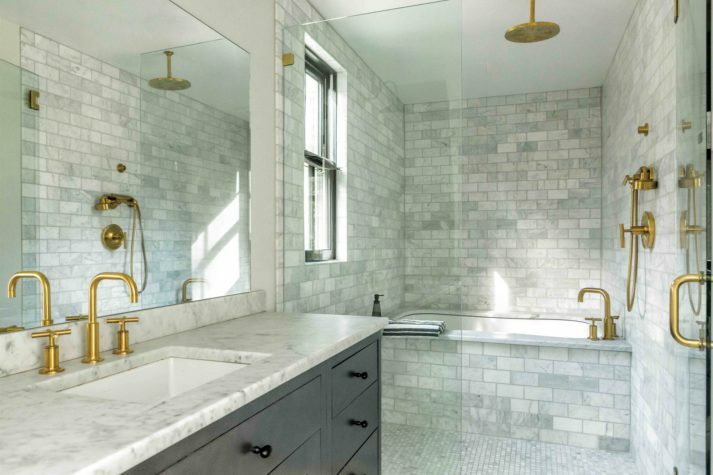 The owners’ suite bathroom features Carrara marble, tile by Capozza Tile and Floor Covering Center, lights from Circa Lighting, and fixtures from Koehler. 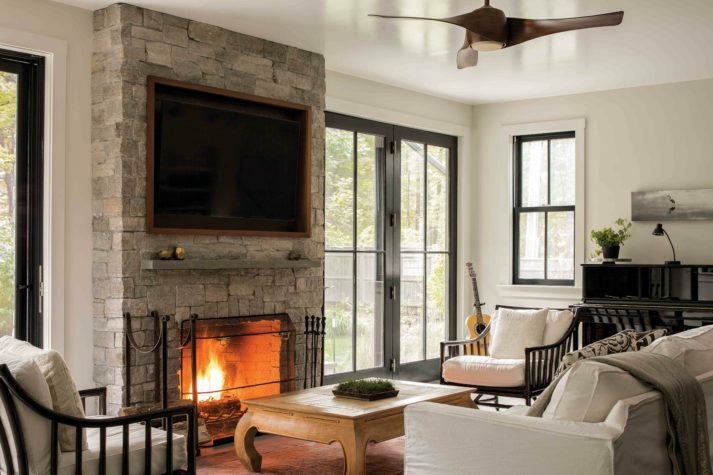 The dual-sided fireplace is made from Boston-blend granite. The ceiling in the living room has been painted bright white to reflect light. The third floor of the house is used as an office space and lounge area. It opens out to a Juliette balcony that overlooks the water. 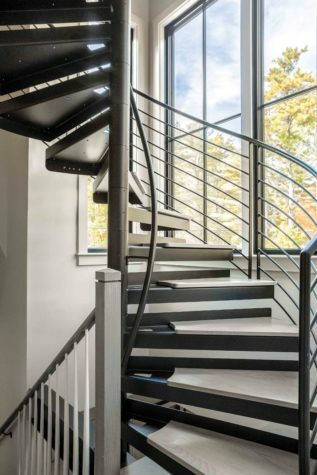 The spiral stairway features a central steel pole and ash steps. 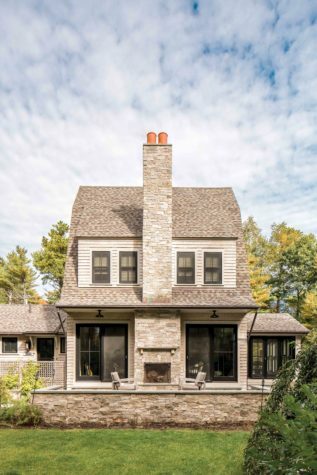 The black windows and doors are a bold style decision that contrasts nicely with the cedar shingle siding. Windows are by Marvin Ultimate. An anonymous contractor gave the house its name. 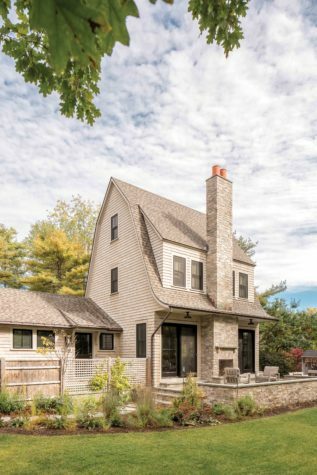 He was working on a different project on Prouts Neck when he noticed the steep roofline and unconventional angles—how the gambrels point toward the sky as though they want to climb higher—and he noticed the intricate detailing on the black gutters and creamy wood siding. He began calling the diminutive home “The Birdhouse.” The term spread, as aptly given nicknames are wont to do, and soon the team working on the Birdhouse, headed by Jenny and Josh Morrison of R.P. Morrison Builders, began to use the name. Eventually, even the homeowners got on board. “We do use it like a birdhouse,” says homeowner Colleen Alford, who spends many happy hours sitting in her third-floor study, looking out over the water and waiting for her teenage daughters to return home for dinner. “In Providence, where we live, I have to drive them everywhere. But here, they can be free. They can take their bikes out and do their own thing, and then fly back home,” she says. Powers and Carlson designed a new layout that would gain vertical space without encroaching on the protected coastline. The house’s elaborate stone work was designed for exterior living and continues to be one of the house’s major features. Although Jenny doesn’t like to play favorites, she says this house was one of her best-loved jobs. “I see a lot of ideas out there that get regurgitated, and I take a lot of pride in building something really unique,” she says. “It has won awards, but it’s not the accolades I care about. It’s that our peers recognize an outstanding build.” And this build, from the poured concrete foundations to the shiny copper stovepipes, is exactly that. 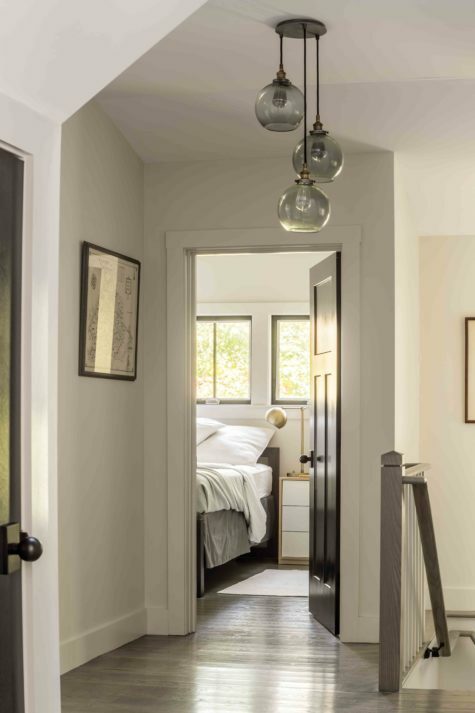 The hallway leading into the guest room is lit with glass globes from Restoration Hardware. 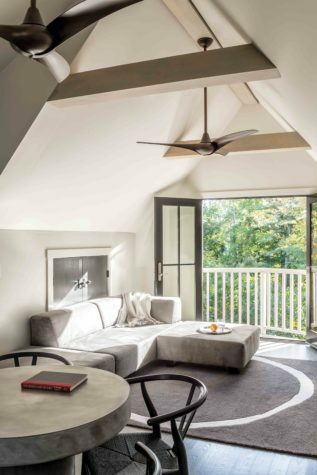 A scene from the owners’ suite shows the dramatic nature of the color scheme (note the black windows and the white high-gloss ceiling). 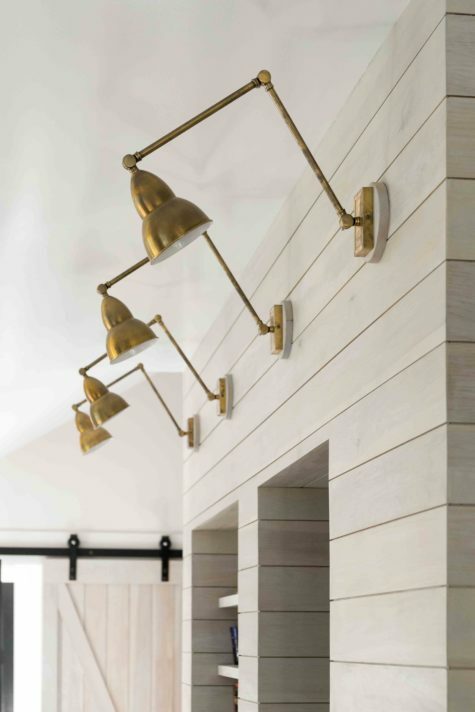 Four brass lights from Circa Lighting illuminate the entryway.